Indigo Airbus A320neo VT-ITK. Image copyright Vedant Agarwal. Indigo Airlines reported its third-quarter results this Wednesday. While the results showed an improving trend compared to the last two quarters with a profit figure of 190 crores, overall the results highlight the core challenges in the Indian market. Indigo ended the quarter with 208 aircraft effectively becoming the first Indian airline to have more than 200 aircraft in the fleet. The mix was 66 A320 NEOs, 1 A321 NEO, 127 A320 CEOs and 14 ATRs. The A321 NEO is the most recent addition to their fleet and gives them an instant capacity advantage of 19% while lowers seat mile costs by 10%. The A321s, for now, will be financed via sale and leasebacks which will further strengthen Indigos cash position. Current plans call for the A321 NEO to be deployed mainly on international operations and interspersed with domestic runs which gives Indigo the ability to leverage its slot portfolio. On the network, metros continue to be core to Indigo’s growth plan. With more than 100 flights from each metro, Indigo will now use this domestic traffic to further feed its international network. 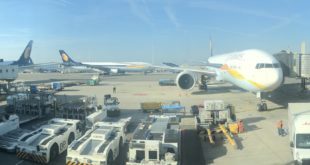 International expansion is a clear focus area and the airline seems very confident that it will be able to take on legacy carriers – both domestic and foreign. To highlight this Indigo shared a statistic that currently it only carries 6% of India’s international traffic while 61% is carried by foreign carriers. Initially, the international expansion will focus only on cities within 6 hours of flying range and it seems that in the coming financial year Indigo may accelerate deliveries of A321s to boost its international expansion. The codeshare with Turkish Airlines that was announced recently is just the first step towards this expansion. Other competitors will follow and indeed one has seen GoAir try to expand presence in Kannur (without the strong domestic network, SpiceJet look at several SE Asian destinations and Vistara and AirAsia will soon follow). 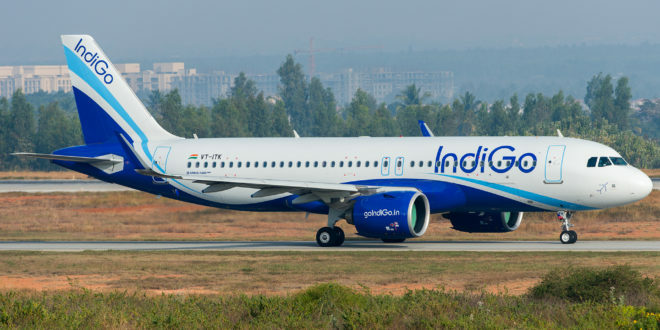 With reference to the Airbus A320neo’s engine issues, Indigo indicated that they only have one aircraft on ground (AOG) and all other NEOs are flying (compare this to GoAir, the other Pratt & Whitney NEO operator in India, which has at least 4 NEOs parked for engine replacements). Further, they were confident about the reliability of the airplane and that it posed no issues. An interesting statistic was given by them highlighting that the inflight shutdown rate was .02 per 1000 flights which is well below the limit prescribed by the FAA. That said, industry sources highlight that challenges remain on the NEO and resolution dates are not certain. On the commercial front, Indigo indicated that in Q3 pricing power in the 0 to 15-day window was picking up. This is critical as the last minute bookings carry with them the highest fares. In terms of sales, October was weak with November and December trending stronger. This coincided with the fact that Diwali was in November this year and that November and December also saw oil prices going down (which would have helped margins). Ancillary revenues were by 15% and in spite of significant capacity addition through Q3 (55 aircraft inducted till date), the load factor decline was only 3 percentage points and came in at 85% which is commendable. The yield uptrend may be shortlived as airlines have already started announcing discounts yet again. Jet Airways came out with their republic day sale for INR999 and GoAir soon followed. With Indigo’s stated position that it will always be competitive, ongoing fare wars are inevitable. The elephant in the room that nobody spoke about was Jet Airways. 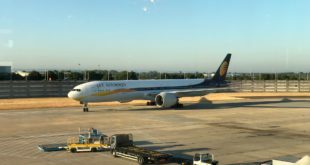 Bangalore Aviation estimates that Indigo would also have gotten a traffic uplift as nervous travellers did not book on Jet Airways or travellers attempted to burn miles on Jet – both of which would be negative and shift hi-yield traffic to indigo. We believe this traffic would have come to indigo because of the network, the schedules and the frequencies. On Gulf sectors, Indigo most definitely saw traffic that migrated from Jet to Indigo – largely due to aggressive pricing. Additionally as Indigo grows large, it will have to demonstrate that it is not taking advantage of its position. The backlash from competitors has already begun – most recently as seen with the announcement of the Government’s plan for slots where no airline will hold more than 50% slots at any airport. The clear beneficiaries of this policy: all airlines other than Indigo. As the other airlines also grow aggressive, Indigo will have to play cautiously as its size while it is an advantage – can also be a challenge. Indigo’s CEO designate (Rono Dutta) seemed to be very positive on the sector and on the Indian market. With the economy growing at 7% and air traffic at 20% indeed there is cause for optimism. But we maintain that this is all price driven growth and to this end, Indigo highlighted its focus on costs and cost reduction (that is the only way to keep fares low and attract more travellers). The structural challenges the market faces remain these being ATF prices, constrained airports, two full-service carriers with weak financial positions, regulatory interventions and an election year. Overall the results were good, we believe they highlight significant challenges in the Indian market. It is clear that the market needs one player to fail else this kind of capacity absorption will lead to a drastic decline in yields. Additionally Indigo does not seem to want to slow down in capacity addition and for the coming year will likely have a capacity goal of 25% by ASKs. Add to this the airport constraints (see our article on no new runways in the last 50 years). Thus, while indigo maybe very optimistic on the induction we fail to see where these aircraft will even be parked – let alone be flown. It is a great time to be a traveller and as other airlines try and match capacity and price, fares will likely go lower. International expansion will also mean stimulation which means international fares will also be very competitive. The wars in the sky have just begun.